Last Christmas dance troupe Flawless appeared in pantomime alongside the Chuckle Brothers. The Britain’s Got Talent finalists played the Evil Queen’s attendants in Snow White at Mayflower Theatre over in Southampton, and got to know the brothers well during the run. Barrie Chuckle died in August after a fight with cancer. Marlon ‘Swoosh’ Wallen looks back fondly on the experience. But being in panto is just one opportunity the street dance crew has seized upon since their big break on BGT in 2009. They appeared alongside Kylie Minogue for The Queen at the Diamond Jubilee Concert outside Buckingham Palace, have made several appearances on Strictly Come Dancing, appeared in the opening ceremony of the 2012 Paralympic Opening Ceremony and collaborated with the English National Ballet. ‘It’s been an amazing time, because just from dance, we’ve been in so many different spaces like that, you know? Yes, the band are out on a mammoth 45-date UK tour, revisiting their 2010 show, Chase The Dream. The crew were founded by choreographer Marlon with business partner Amelia Benoit in 2005, but it was appearing on the hit ITV show that took them to another level. Flawless made the final but were pipped by Susan Boyle and fellow dance team Diversity. ‘We did this show not long after BGT, so this is more like a reboot - we’re bringing it back. It was a great success in 2010, it’s been a request for quite some time, to be honest, so we were looking for the right time to do it. And it’s still most of the original dancers. Given the demanding routines the guys put themselves through, how long can they keep performing at this level of intensity? And as Marlon explain, this expansion was always part of the plan. ‘It was all a dream, we always had this in our 10 year plan, now it’s coming to fruition it’s amazing to see, but we’re still learning, and there’s still more to do. We’re always working ahead, and we’re always trying to develop new directions. And teaching the next generation, particularly at their dance school in London, is something Marlon is passionate about: ‘When we first started this, I came from a background where my family were very concerned, they were like, how can you actually make a career out of dance? Because no-one had done this before, and they were so used to the traditional nine-to-five working person. But that’s not to say they take their ongoing success for granted. And this goes right back to the core of what Flawless aims to stand for. ‘With this show, it’s a heartfelt show , it’s called Chase The Dream, and that’s always been our motto, our passion, our driving force to get us where we are today. ‘And over the years we’ve realised that doesn’t apply just to dancing and Flawless, it applies to anyone, worldwide. ‘You could be passionate about something, but the distractions you face in life – whether it’s responsibilities, work commitments, bills – it’s the real life problems we face from day-to-day, put you off. ‘This show’s not just tailored for dancers, it’s tailored for all ages, for families, the person who wants to become a musician or be a lawyer, and they’re stuck in a job that’s not taking them where they want to go. 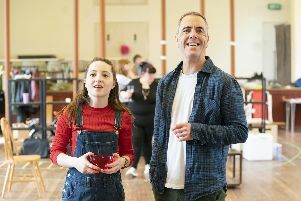 ‘Chase The Dream does what it says on the tin, you get an emotional rollercoaster journey – you’re going to be excited, you’re going to be sad, you’re going to be blown away, and most importantly you’re going to feel like you’re a part of the show. Flawless Presents Chase The Dream is at The Kings Theatre, Southsea on Sunday, September 30, doors 6.30pm Tickets £25. Go to kingsportsmouth.co.uk.